If there are any naysayers out there (I’m looking at you, Australian government), who still can’t see that Australian developers produce an amazing standard of video games, they only need to look at Assault Android Cactus, the latest in a very long line of quality, made in Australia, titles that we have enjoyed this year alone. Developed by Witch Beam, this is a cross between bullet hell and a twin stick shooter. 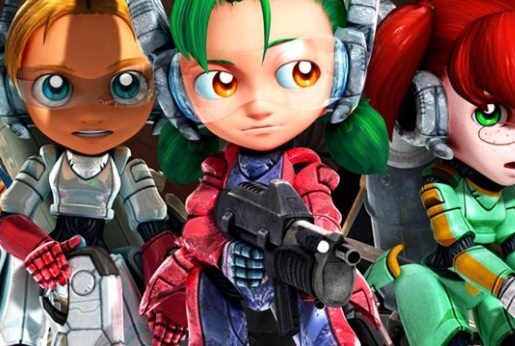 In it, you play as members of the space police, a team of androids led by the figurehead Cactus, who, along with her female friends, battle through a spacecraft named the Genki Star to rid it of its malfunctioning robot workers. Each level consists of surviving a constant onslaught of enemies in different arenas. To start with these arenas are stock standard rectangle and circular designs, but later in the game, level design gets creative. Moving levels and levels that build around you start to appear, and these offer variables that often clash with the preciseness needed to survive a bullet hell game, which keeps you on your toes far often than it should. Assault Android Cactus also has a different way of implementing a health bar. Each android can only take a certain number of hits before it is deactivated, but it can be deactivated as many times as long as the battery has power. Once the battery runs out of power, the game is over. Defeated robots will sporadically drop batteries for the player to pick up, along with power ups that boost the strength of the android. However any time the android is deactivated, she loses all of her built up weapon strength and any acquired power ups, plus the recovery time does eventually cost you precious battery time. See? I said this game was chaotic. Colour is also a big aspect to the gameplay. Because of the sheer chaos of the on-screen carnage, Witch Beam have been careful to ensure that the player still has a way of understanding of what’s going on. Bullets shot by the enemy robotics are coloured blue, where anything shot by the androids is coloured yellow. These stand out in the sea of objects and movements, and those little dots of colour are in many cases the difference between life and death. If anything, the large amount of activity on screen can be at times claustrophobic, and it becomes simply too chaotic to facilitate the precision of tight movements normally required in the bullet hell genre. Though, there’s nothing more exhilarating than escaping from a seemingly endless amount of enemies without a scratch. The game is also fully co-operative, with four players being able to join in any game mode. With four players shooting at once, the action on the screen is absolutely mental; think a Lady Gaga/Hatsune Miku concert, with lasers flying everywhere, accompanied by a thumping soundtrack (I like how Sam is learning to stick Hatsune Miku in everything. Well done, young padawan - ed). It is brilliant. The soundtrack is quite electronic, a fitting choice for a game all about robots, and in an interesting addition, the music changes to suit the performance of the player. It’s a great audio accompaniment to what is a very visual experience. In addition to the robust story campaign, which takes a few hours to complete, and however many more to get a decent high score on, there’s an endless mode and a daily challenge, both of which will test the skills of even the best players out there. Ever since I played Assault Android Cactus back at PAX Australia in 2013, I’ve been in love with it. it has a very steep learning curve, but once you get your head around it all, it’s incredibly fun. The eight different androids to play as also bring eight different play styles. Some of the girls carry heavy weaponry while others focus on crowd control, and this diversity is best showcased when playing with friends. It is local multiplayer only at the moment, and while it was a bit difficult to get more than two players around my desk, I’m confident that when the game launches on consoles it’ll be one of the finest local multiplayer experiences you could hope for on console. Assault Android Cactus is yet another great Australian indie game that demonstrates why this industry deserves far better support from both the major publishers and the Australian government than it is currently getting. Item Reviewed: Review: Assault Android Cactus (PC) 9 out of 10 based on 10 ratings. 9 user reviews.